InshaAllah, Shaykh Samir al-Nass will be visiting the school and delivering a series of talks based around character and improving one’s self. We have opened this visit up to member of the public (ladies only) who are welcome to come. Please indicate your attendance by joining the event on our facebook page. Can we kindly request that guests coming to the School for the visit by car do not park in the school's car park, as it will be in use by the girls during the day and parents will be coming in to collect their daughters at the end of the day. Parking spaces are available on the roads surrounding the school: Spring Road, Olton Boulevard East, Summer Road, Fox Hollies Road and Shaftmoor Lane. Please do not park in the car parks owned by our neighbours, as these are also in use during the day. Spring Road Station is located across the road from the school, and bus services 11A, 11C, 31, 31A, 36 and 40 have stops near the school. More information about the public transport links can be found on the Transport page on this website (this can be found in the Parents & Students section). The entrance of the school drive is indicated on the map below. 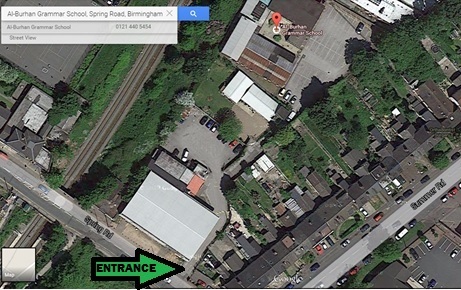 Please walk to the end of the drive (past the scouts centre) and press the buzzer. The first Annual Seerat-un-Nabi Competition took place at Birmingham Central Mosque. There were several competitions, including Nasheed, Qirat, Speech and Quiz competitions, in which students from Islamic schools from all over Birmingham took place. Four of our girls (two Year 7 students and two year 11 students) entered the Nasheed/Naat competition. One of our year 11 students placed 2nd MashaAllah. Three of our girls (one Year student and two Year 11 students) entered the Qirat competition. We would like to congratulate them for taking part. May Allah (SWT) give them the tawfiq to continue with this and give them a love and enjoyment of such recitation. Ameen. Alhamdulillah, by the Grace of Allah (SWT), Al-Burhan Grammar School staff and pupils are celebrating the outcome of the recent Ofsted inspection carried out in November 2014. Ofsted graded Al-Burhan once again as an outstanding school. May Allah (SWT) give us the tawfiq to continue with our work. Ameen. Al-Hamdulillah, by the blessing of Allah, The Most High, Al-Burhan Grammar School pupils are celebrating excellent GCSE results this year again. The pass rate is 100% (A*-C grades in 5 of more GCSE subjects including English and Maths), and most of our girls will be going on to study their chosen subjects and courses at sixth form/college. Our highest achieveing Year 11 pupil achieved 8 A*s and 4 As in English Language, English Literature, Mathematics, Biology, Chemistry, Physics, Art & Design, Religious Studies, Statistics, Urdu, History and Business & Communication Systems. She will be attending King Edward VI Camp Hill School for Girls Sixth Form. Overall, 47% of year 11 grades were A*/A and 88% pupils achieved the English baccalaureate. The Head Teacher, Dr Mohammad Nasrullah, commented: "I am delighted with these excellent GCSE results. I would like to take this opportunity to congratulate the students, their families and particularly dedicated teachers. We are confident that our pupils will leave Al-Burhan prepared to pursue further studies”. May Allah (SWT) continue helping them to succeed in their attainment of knowledge and give them a passion for the deen. Ameen. 100% GCSE pass rate 4 years running with 37% pupils getting places at King Edwards Sixth Form this year.